The king of sportswear has both the willingness and the resources to continue rewarding investors. 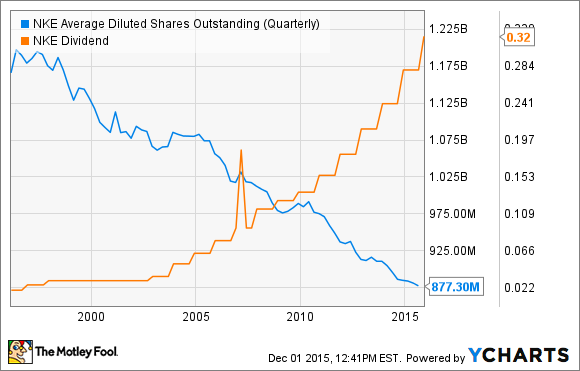 Nike (NYSE:NKE) is not a particularly popular name among dividend investors. This is understandable, since the dividend yield is not high -- less than 1% versus its current stock price. On the other hand, the company is building an amazing track record of growing dividends and buybacks, so maybe Nike deserves some serious consideration from cash-loving investors. Nike is an undisputed world leader in sports shoes and clothing, a promising industry offering exciting prospects. Consumers around the world are increasingly health conscious, and trendy brands such as Nike, lululemon athletica (NASDAQ:LULU), and Under Armour (NYSE:UAA) are being used not only inside the gym, but also as informal clothing for everyday activities. Lululemon is going through a big transition, since it's still recovering from the see-through pants scandal and the boardroom battles that seriously disrupted its operations in 2013. However, Lululemon still managed to deliver strong growth last quarter, with total revenue increasing 16% year over year to $453 million. Lululemon's comparable sales grew 11% on a constant-currency basis, so the company is clearly making progress when it comes to bringing customers back to its stores. Lululemon and Under Armour are materially smaller than Nike, so it's easier for these companies to deliver faster growth from a smaller revenue base. On the other hand, Nike remains the unequivocal industry leader thanks to its powerful brand, huge global presence, and massive marketing budget. Demand for high-quality sports clothing is soaring, and Nike is in a position of strength to capitalize on this opportunity. In addition to a 2-for-1 stock split, Nike has recently announced an increase in dividends and a new share buyback program. The company raised its dividend by 14%, and management announced a new share repurchase program for 12 billion over four years. The dividend yield is still modest at less than 1%, but the company's track record of dividend growth is quite impressive, Nike has raised dividends in every year for the last 14 years. When considering both dividends and share buybacks, Nike has returned over $23 billion to investors over that period.